Microwave News reported that the NCRP last reviewed the radiofrequency health literature and issued exposure guidelines 30 years ago so the advice provided to CDC was obsolete. Moreover, the NCRP chairman of the board who led the effort to pressure CDC has a serious conflict of interest as he has served for many years as an expert witness for the cell phone and broadcast industries. A CDC spokesperson told the Times that the cellphone industry did not weigh in before the new warnings were released. Does this imply that the industry "weighed in” after the warnings were published given that they were abruptly removed? Dr. Christopher Portier, former director of the CDC National Center for Environmental Health, disagreed with CDC’s decision to retract the warnings. He believes there is sufficient evidence for parents to be cautious about their children’s cell phone use, and that parents should be warned. Dr. Portier was among 31 international experts for the International Agency for Research on Cancer (IARC) of the World Health Organization (WHO) that declared cell phone and other wireless radiation a possible cancer-causing agent. The cellular industry has rejected health concerns and sued Berkeley, California which passed a cell phone law last spring requiring local retailers to inform their customers about safety information mandated by the Federal Communications Commission. Electromagnetic Radiation Safety and Microwave News originally reported on this controversy in August, 2014. Microwave News posted a piece which poses important questions about the Times article. Thanks for your interesting article on CDC's reversal on its advice with regard to the possible ways to use cell phones. First: the misleading way that some have characterized the volume and quality of data pertaining to possible hazards "there is NO evidence of a hazard" really means "the many studies suggesting a hazard do not meet my unstated criteria for entering them into evidence." Second: their unhelpful way of characterizing their willingness to certify a causal link between cell phone use and cancer. How would we react to a TV weather reporter who said "I can't say for sure that it will rain tomorrow, but I can't say that it won't rain either." What we have come to expect is a statement like “After considering the evidence we certify that there is a 40% chance of rain tomorrow." This second statement allows the girl wearing a satin Prom Dress to bring an umbrella just in case, and the person wearing a tank top, shorts and flip flops to leave his umbrella at home. Third: The unspoken assumption that the government can only share causal judgments with the public if it is absolutely certain. The government has all kinds of information about ways of using cell phones that could drastically lower exposure. Some parents would take precautionary actions if CDC was 20% sure of a hazard, others would take action only if CDC was 90% certain. They have a right to take informed action. Why is CDC not packaging their judgment in ways that the public can use? Fourth: CDC's lack of transparency in revealing the stakeholders who complained about their first statement and their reasoning in rephrasing it. My exasperation is influenced by being a co-author of a text book on quantitative decision analysis in medicine and from heading up a decade-long policy project about magnetic fields from power lines at the California Department of Public Health. Dr. Neutra retired in 2007 as Chief of the 200-person Division of Environmental and Occupational Disease Control after 27 years in the California Department of Public Health. He received his medical degree at McGill University in 1965 and his doctorate in epidemiology from Harvard School of Public Health in 1974. He has taught epidemiology at the Harvard Medical School and School of Public Health and University of California at Los Angeles (UCLA) Schools of Medicine and Public Health. He is author and co-author of more than 100 articles and co-authored a text book on quantitative decision analysis in medicine. Between 1994 and 2002 he was in charge of the Electric and Magnetic Fields Program in the California Department of Public Health, a seven million dollar policy-relevant research program. It asked the question "How certain must we be of how much EMF-related disease before we move from the status quo to cheap or expensive avoidance of magnetic fields?" 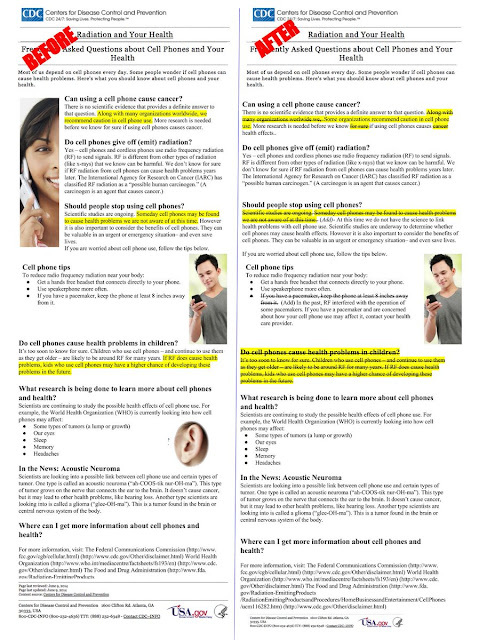 Environmental Health Trust posted a piece which documents the changes CDC made to its cell phone radiation warnings after receiving input from industry-funded scientists. The top two news stories about cell phone and other wireless radiation this year were the International EMF Scientist Appeal and the Berkeley cell phone "right to know" law.